Variable 4 takes live weather data from the environment using a research-grade weather station, Campbell Scientific's BWS-200. This information, updated every few seconds, is used to drive a web of compositional processes resulting in a dynamic composition which responds in real-time to the current atmospheric conditions. At the core of this process is a piece of software, designed by the artists, which plays the role of conductor, navigating across a map of movements corresponding to potential combinations of weather. On a more fine-grained level, each movement comprises of score fragments and compositional processes, which are altered and recombined by second-to-second changes in the surrounding weather. 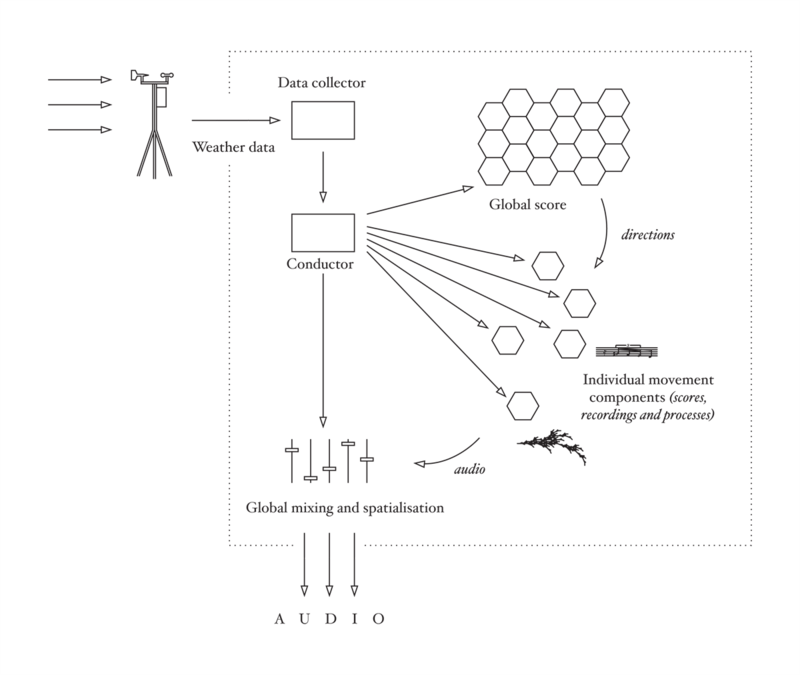 Finally, the collective musical elements are diffused over eight speakers by a spatialisation component, also conducted by real-time weather conditions.